Traditionally, schemes depicting auxin biosynthesis in plants have been notoriously complex. They have involved up to four possible pathways by which the amino acid tryptophan might be converted to the main active auxin, indole-3-acetic acid (IAA), while another pathway was suggested to bypass tryptophan altogether. It was also postulated that different plants use different pathways, further adding to the complexity. In 2011, however, it was suggested that one of the four tryptophan-dependent pathways, via indole-3-pyruvic acid (IPyA), is the main pathway in Arabidopsis thaliana,1 although concurrent operation of one or more other pathways has not been excluded. We recently showed that, for seeds of Pisum sativum (pea), it is possible to go one step further.2 Our new evidence indicates that the IPyA pathway is the only tryptophan-dependent IAA synthesis pathway operating in pea seeds. 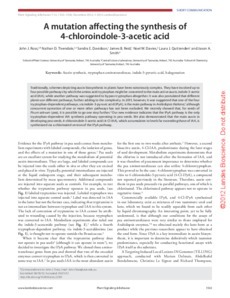 We also demonstrated that the main auxin in developing pea seeds, 4-chloroindole-3-acetic acid (4-Cl−IAA), which accumulates to levels far exceeding those of IAA, is synthesized via a chlorinated version of the IPyA pathway.